PMTS.org • View topic - World Cup men comparisons. Details and explainations are on the BLOG! Re: World Cup men comparisons. Harald, do you think that Kristofferson's leaning in (lack of CB) has gotten worse the past 2 years versus when he first came onto the WC? I'm sure Hirscher is faster but it also seems like Kristofferson is not skiing nearly as well as he did. At one point in slalom he was beating Hirscher a few times per season. Clearly not any more. Would be interesting to compare present day Kristofferson to Krsitofferson when he was winning. H.C. is making a longer arc and his retraction isn't nearly as good as it was 2 years ago. He is pressing and that sometimes takes you in the wrong direction. If I were his coach, he'd be double hand blocking (to deal with his CB and CA) and have him doing retraction exercises. His hip rotation comes with the leaning away from the ski. The things he's missing show up in so many different ways. Right now they don't have answers for him. It's not only that Hirscher is faster now, but that others are passing H.C. So it's not only Hirscher answering the call. Look out for Noel, Schwartz and even Feller. Some of the young Swiss guys are too inconsistent with their technique, kind of like the Norwegians and Swedes in slalom, all over the place. The French guys are doing well, you can see it in the feet. 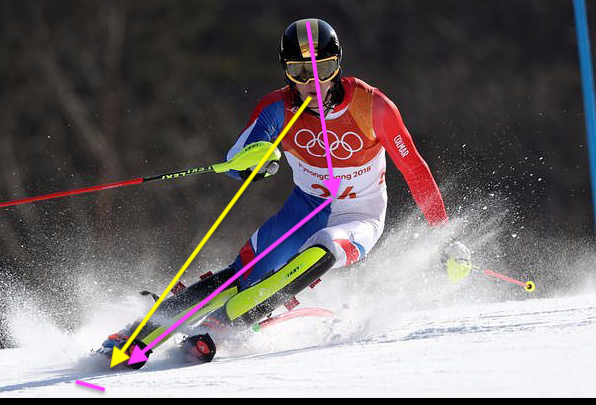 If the inside foot is organized both skis are doing the same thing, and are at the same angle, it's all good. If not disaster looms from one turn to the next. h.harb wrote: H.C. is making a longer arc and his retraction isn't nearly as good as it was 2 years ago. He is pressing and that sometimes takes you in the wrong direction. Could it be that he didn't come into this season with off-snow strength/fitness? That is certainly one area that Hirscher stands above the rest... he's strong as an ox--and it is evident at the end of SL and GS where his competitors look tired and he doesn't. BTW, Harald--one of your best blog posts ever. Many aren't even looking at this among the top skiers. The PMTS lens is a wonderful thing. I looked at these images before reading the blog. Amongst other things what stood out for me was vertical inside arm and angled torso, vs vertical body and angled inside arm - then carefully looking further. 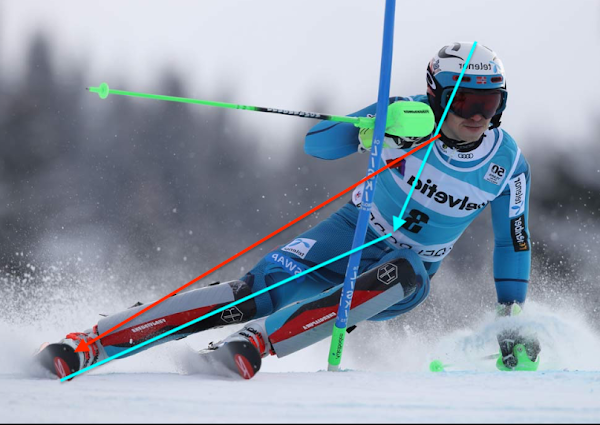 Looking at some of the you tube videos of WC races it seems to be an emerging trend - almost "pivoting" around an inside arm stabbed into the snow at times, or at least using this for support. Is this an extension of the inrigger style?! - not so much for WC racers in some ways, but if emulated more widely then -----. It would be great if all the blogs were loaded into threads here. With PMTS training almost anyone can begin to see the difference between effective technique and going the wrong direction. Example: Porino and Lewis were touting the arm swing technique of Solveig and Norbatton just two seasons ago. Hirscher and Noel don't use that technique because it is wrong for the courses where it gets tough, steep and icy. So where are Solveig and Norbatton today? It's easy to get pulled in the wrong direction during development as too often seen in American skiing. I am indeed the archetypal "almost anyone with a little PMTS knowledge". The arm swing thing always intrigued me and I could speculate about it ... but won't. It's a lack of fundamental biomechanical understanding. It goes right back to; don't just work hard while training, "train right, train perfectly" or the guys that do will slaughter you. The found article "Energy that helps with release and transition" is great and now commented on in other threads. With my PMTS lens I see it as using kinetic energy and turning it into stored energy in the prestretched muscle - with the advantage of not having to use metabolic energy. I do wonder about the role also of tendons and other skeletal components in addition to muscles.